Pine Trees And Pearls: Today is "What did you buy?" FRIDAY! Today is "What did you buy?" FRIDAY! You know I love Fridays. I get to buy something and then share it with you! This is how I have disciplined myself. We all deserve a little something for working so hard all week. Yes I have been on vacation, but I still have been working hard! Doing spring clean up outside the house and doing a little spring cleaning inside too. You may be thinking that is not much of a vacation. Truth is, I have thoroughly enjoyed myself and my home. Here is what I bought this Friday. Two pairs of shoes from Chez Mardine's. (That's just a fancy name I have for Marden's which is a surplus and salvage discount store in Maine.) 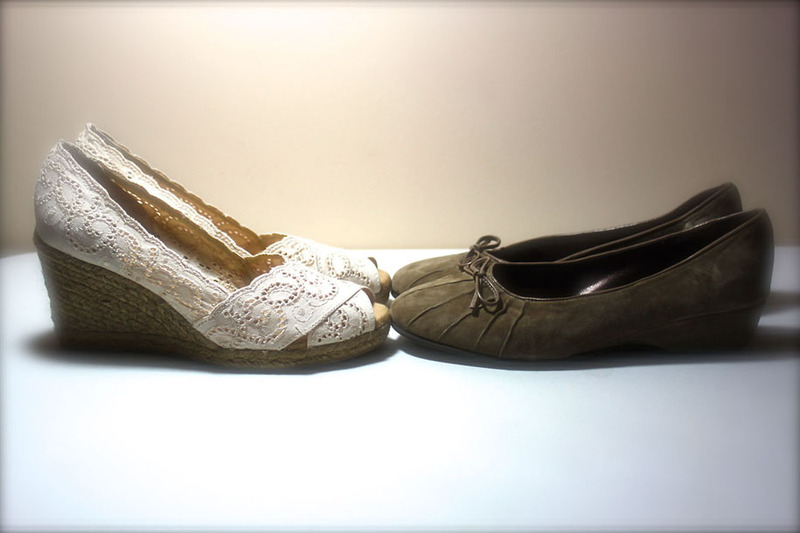 The eyelet wedges are by White Mountain and they are so super comfy. They will look pretty with summer dresses, cropped pants and skirts. The suede ballet flats are Amalfi by Rangoni and they will just look cute with anything. Both of these shoes are so comfortable. I have made a promise to myself to never ever purchase any more shoes that are uncomfortable. I am not even going to settle with the least bit of uncomfort. I just can't do it anymore. I have enough shoes that kill me 5 hours into my day. Now, this thought may change if I get a desk job which I do not see happening and I actually DO NOT desire. For now I will keep on walking fast and fierce in my comfortable yet fashionable shoes.